Funcom's new Conan game was announced last month as a survival-crafting game, which I think caught some folks by surprise, since that doesn't really make it sound like the sort of barbarically violent experience one would expect from a game built around Robert E. Howard's loin-clothed lunatic. But eking out a miserable existence in a harsh and unforgiving world is actually rather fitting, and the first Conan Exiles dev diary offers comforting reassurance that there will be plenty of dismemberment and decapitation. Phew. The intro is cool—Conan himself saves you from crucifixion—and the dynamic sand effects look very promising, even in the early-state game editor. But it's the hacking and the slashing and the hey hey hey it hurts me that we're all here for, and Funcom has plans for that, too. Conan Exiles will be playable solo or on publicly hosted servers, and multiplayer is clearly where the action is: Budding barbarians will be able to build settlements and strongholds, wage war, and even sacrifice the hearts of enemy players to Hyborian gods, to gain divine favor or just to be a jerk. Teamwork will also be encouraged by Purges, special events in which NPC armies from neighboring kingdoms rampage through the land, destroying the work of the exiles—although Funcom hinted that devious players might find ways to take advantage of Purges for more personal gain. 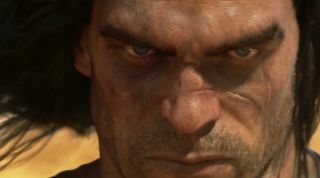 Conan Exiles is slated for an Early Access release this summer. You can find out more at conanexiles.com.